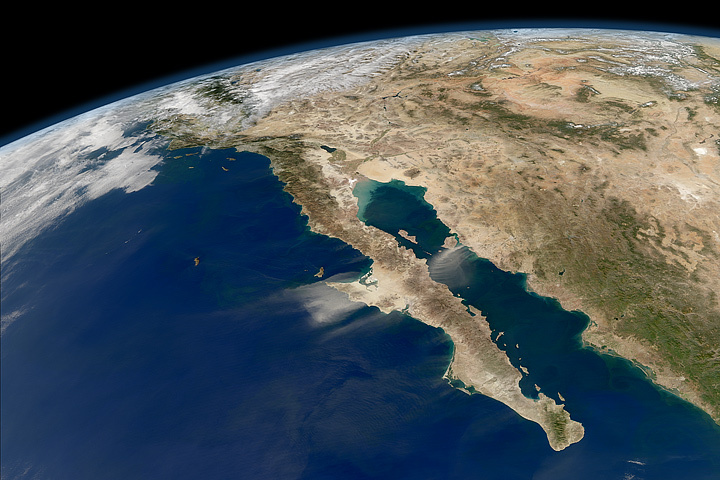 Every May, when the wind is calm, a strange popping sound resonates across the southern beaches of the Baja California peninsula in Mexico. It sounds as though someone is cooking popcorn on an industrial scale. But the source of this sound is far more spectacular. 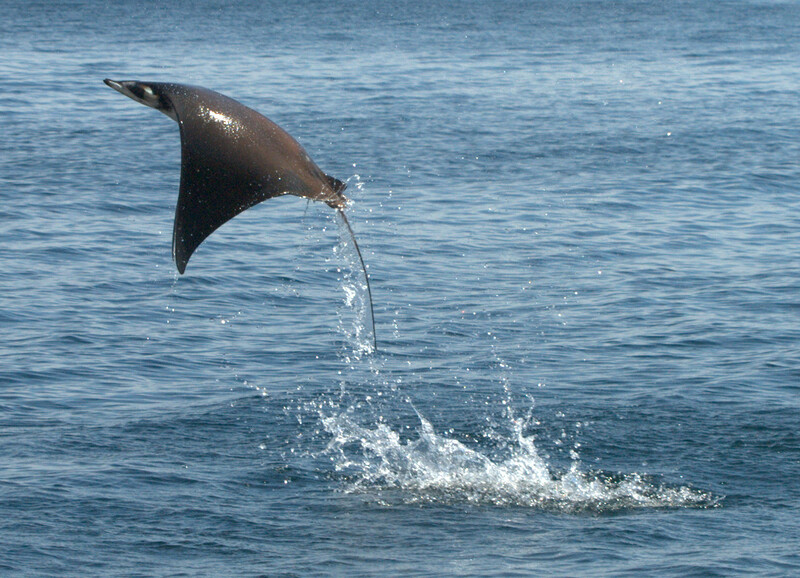 The Sea of Cortes separates the peninsula from mainland Mexico, and is home to a vast array of marine mammals, fish and invertebrates. 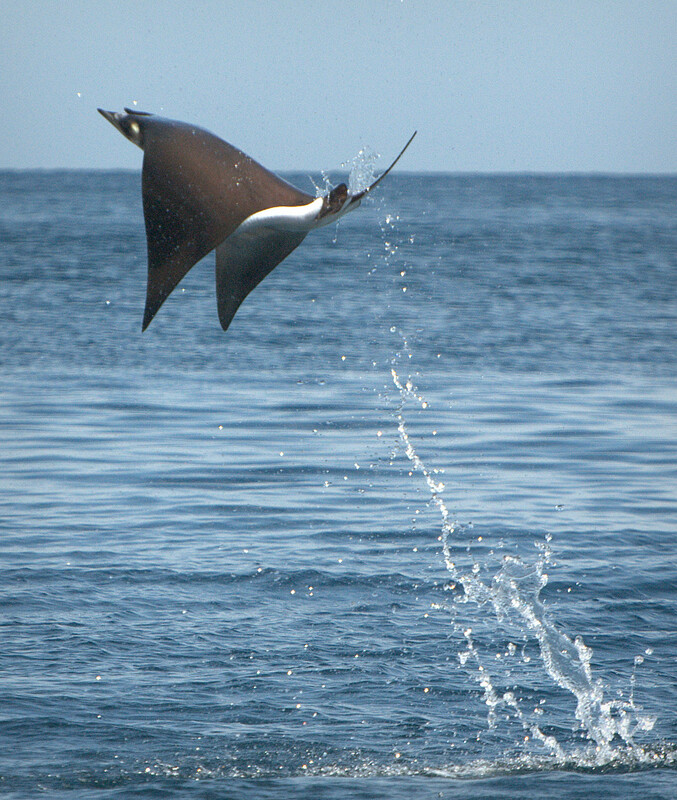 Jacques Cousteau once called this area “The aquarium of the world”, and is one of these magnificent creatures that is responsible for this unique sound. 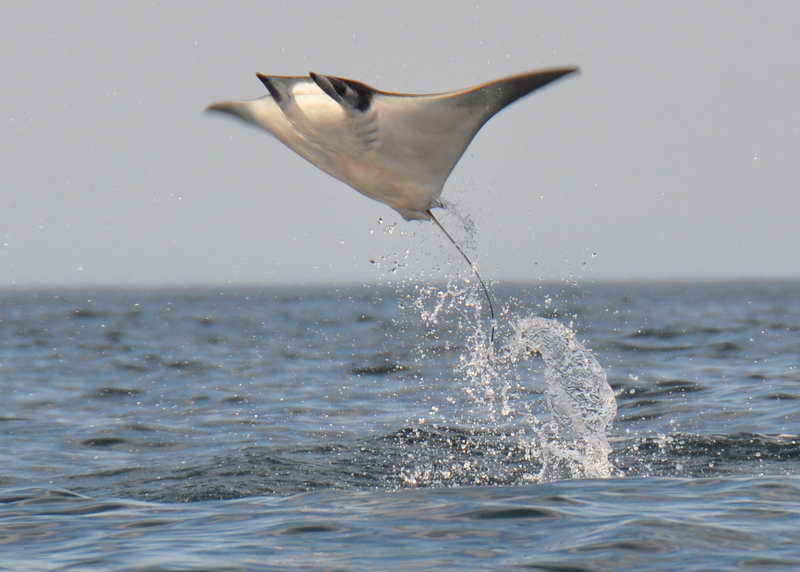 Hundreds of mobula rays congregate in the Sea of Cortes every year. 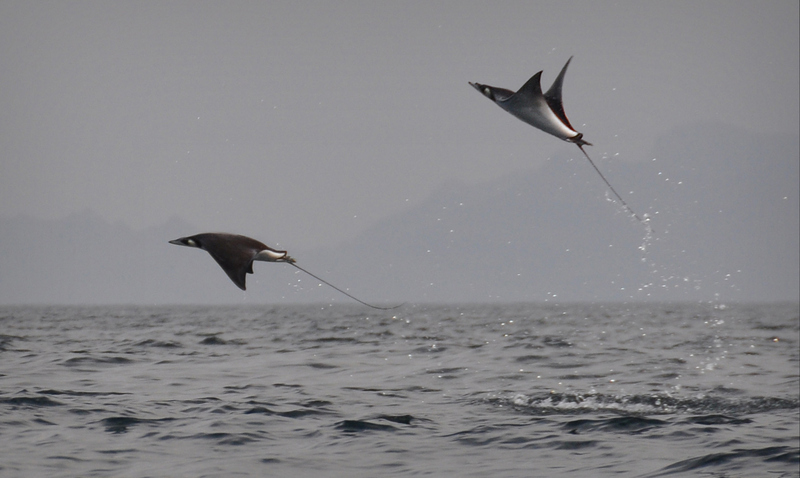 In one of the most spectacular wildlife performances on Earth, they can be seen leaping from the water, sometimes three or four at a time and reaching a height of nine feet or more above the water, before returning to earth with a loud splash. I was privileged to have a front row seat for this amazing show. 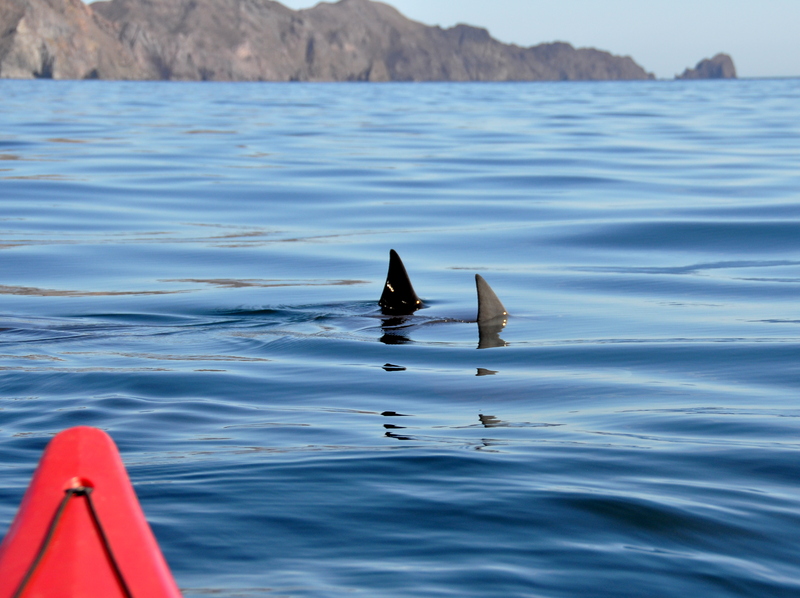 Last year I embarked on a solo expedition to traverse the entire 1,000-mile east coast of the Baja California peninsula,Â from San Felipe to La Paz, by kayak. Twice! Once in spring and again in the fall. 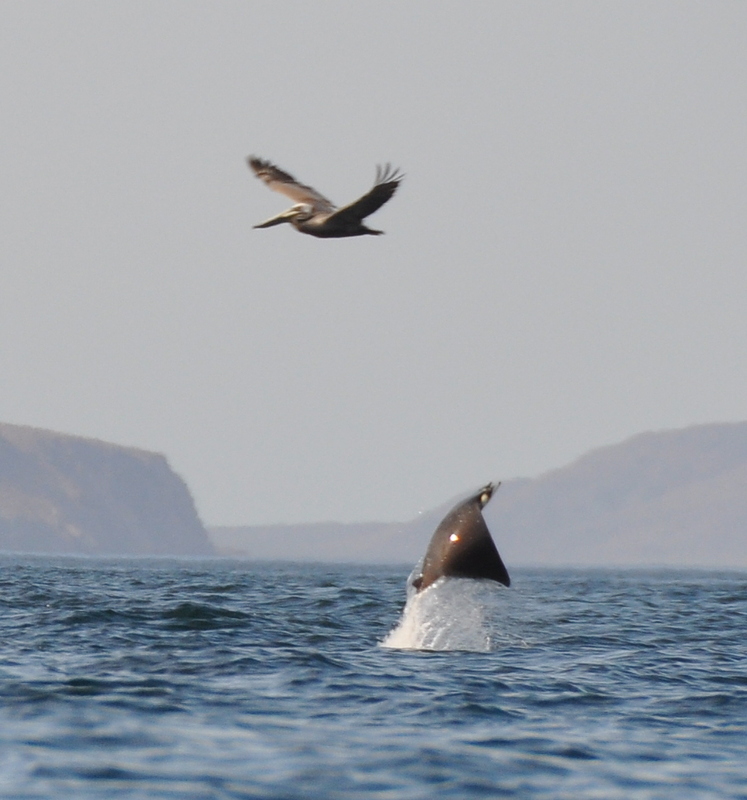 I had many memorable wildlife encounters during the four months I was at sea: dolphins, turtles, sea lions, whale sharks, fin whales, humpbacks… the list goes on. 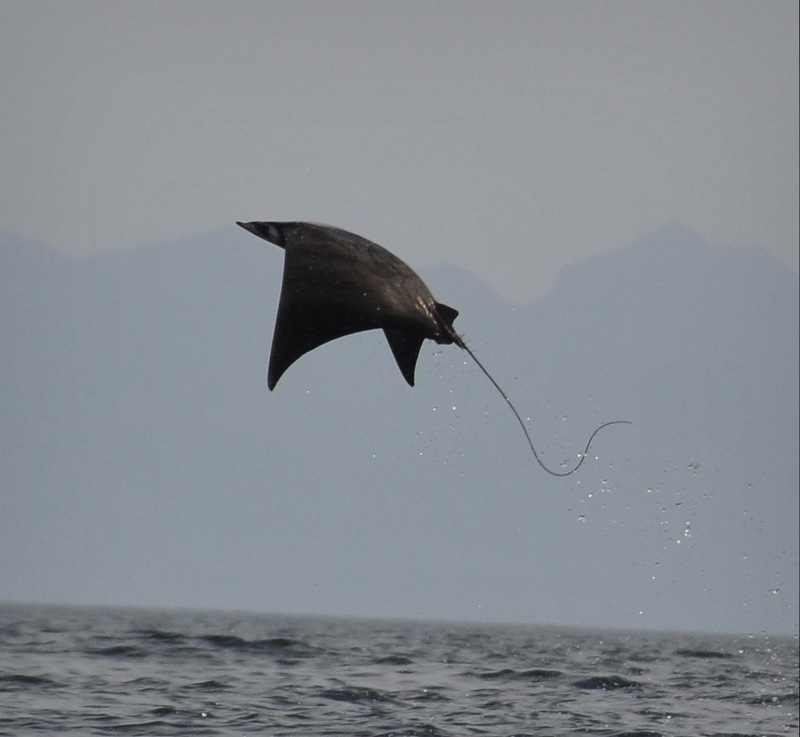 But none were as exhilarating as the flying mobula rays. The kayak proved to be an excellent observation platform. 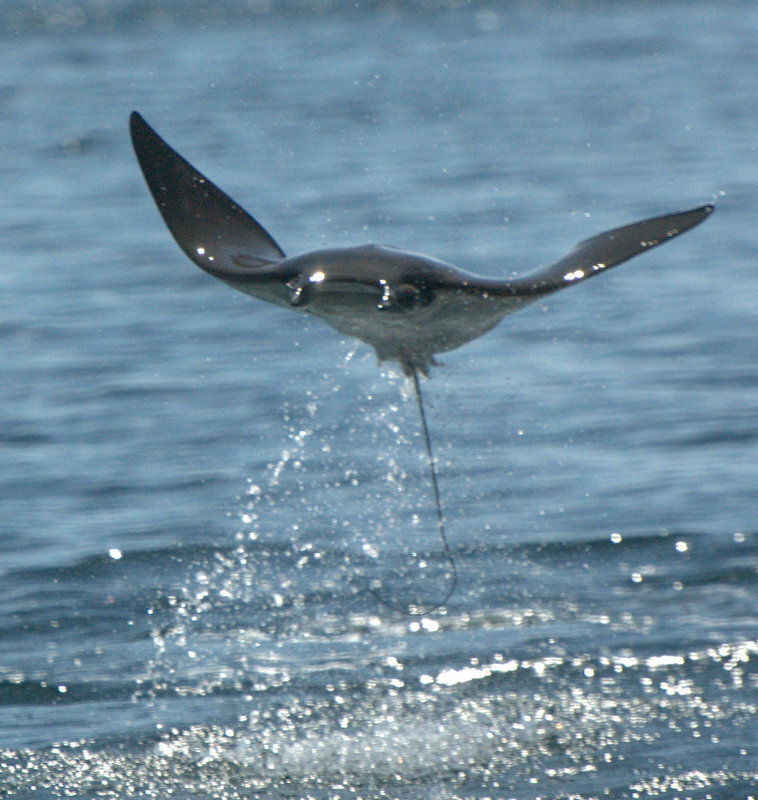 Lacking a noisy propeller, I was able to approach stealthily, and get within a paddle’s length of the mobulas’ acrobatic performances. 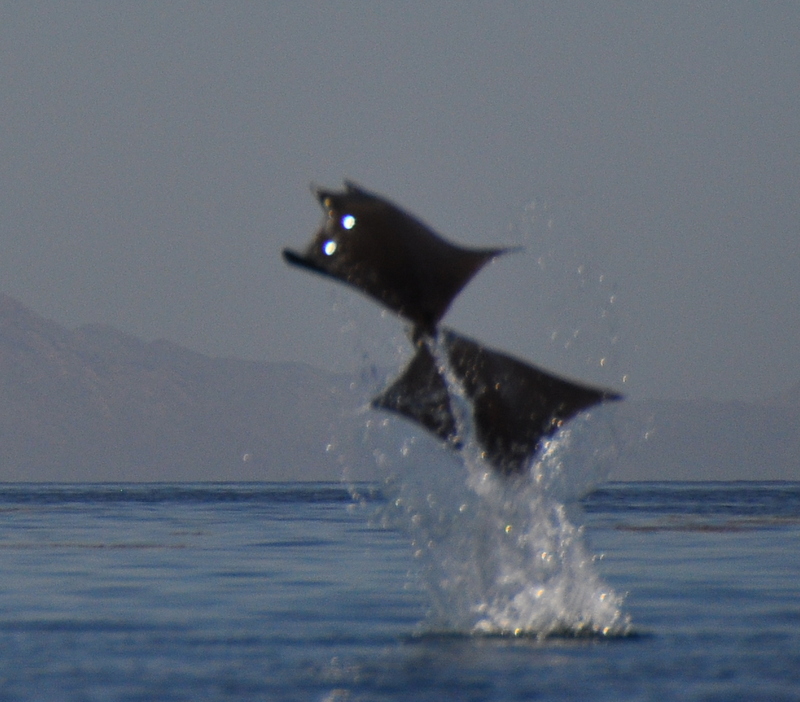 “Why do they jump?” I wondered, as I drifted along. In fact, it seems that no one knows for sure. Perhaps it is a form a social communication. I observed that these displays seemed to start when a group of four or more mobulas congregated just below the surface. 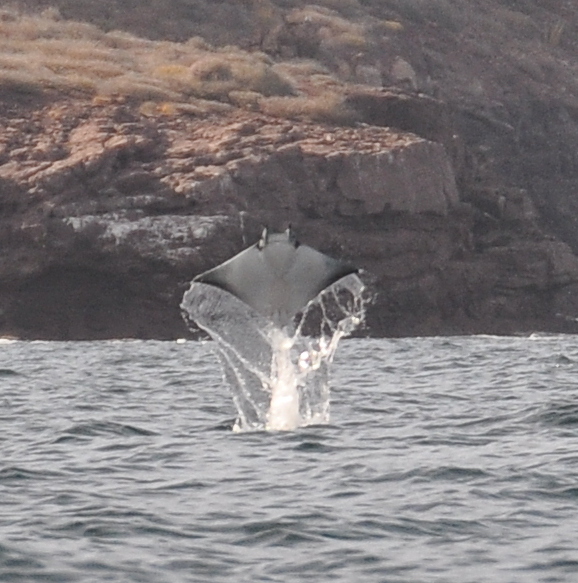 From my position I couldn’t be sure what was unfolding beneath the water, but before long there would be a disturbance of water, the flapping of fins, and suddenly a mobula would erupt from the waves and seemingly reach for the skies. Their grace and elegance were a sight to behold. 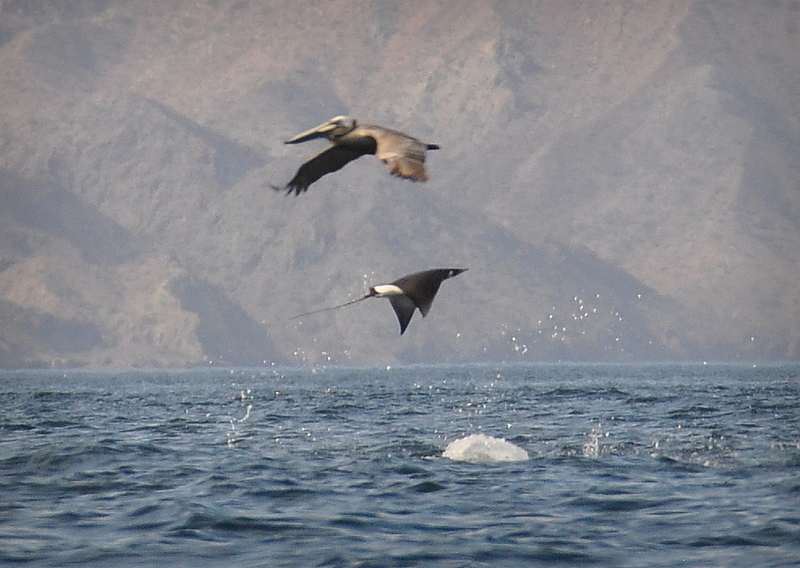 I was amazed at the athletic ability of these high-jumping creatures, almost as though their huge “wings” were equally at home above and below the water. 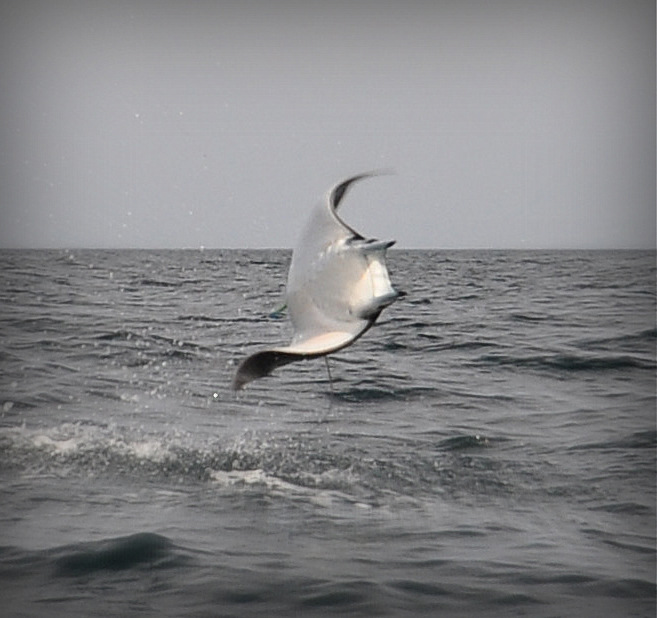 The first mobula would soon be followed by two… three… four more in rapid succession. 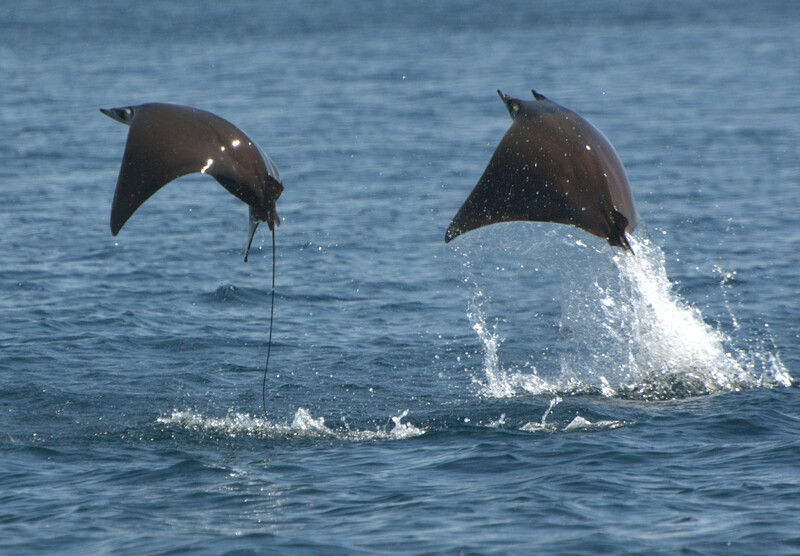 Soon I was in the midst of a jumping fiesta, with mobulas jumping and spiraling and pirouetting all around me. Often I saw them jumping in formation. Like a black-and-white version of the US Navy’s Blue Angels display team, only somehow more elegant. Then, just when it seemed that these dancing acrobats would soar into the sky, gravity claimed them back, and they would return with a loud plop that resonated across the calm sea. 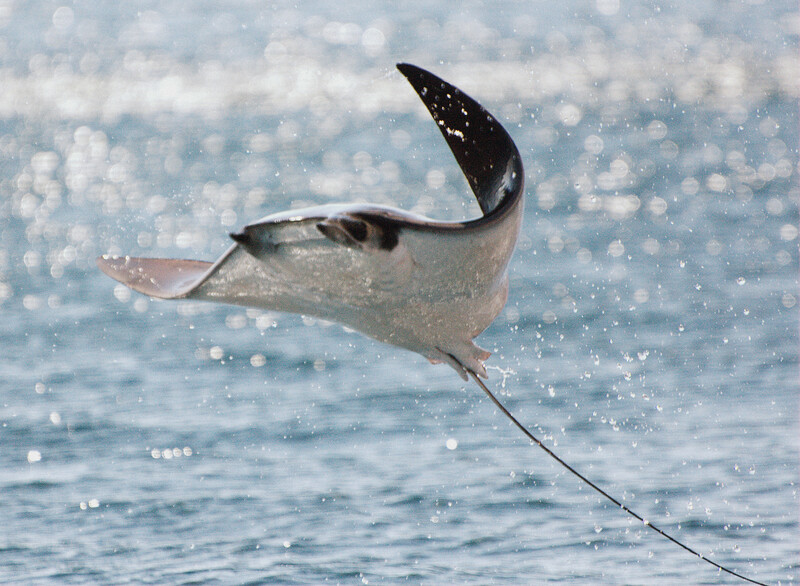 For all their flying grace, they do not return like an Olympic diver, cleanly knifing through the water. Once gravity takes hold, they resemble the funny kid on the high board, who hits the water belly first with a gigantic and seemingly painful splash. Perhaps then this magnificent performance is an attempt to rid themselves of irritating parasites that live in the mucus layer covering the skin. 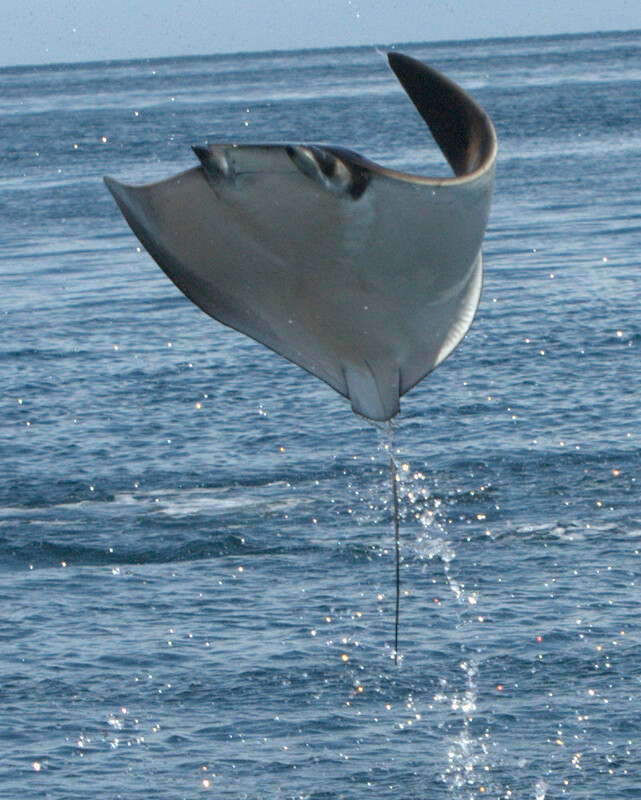 After all, few parasites would be able to keep hold during this turbulent belly flop. Or perhaps–and this is the option I prefer to believe–they do it simply for fun. Just because they can. 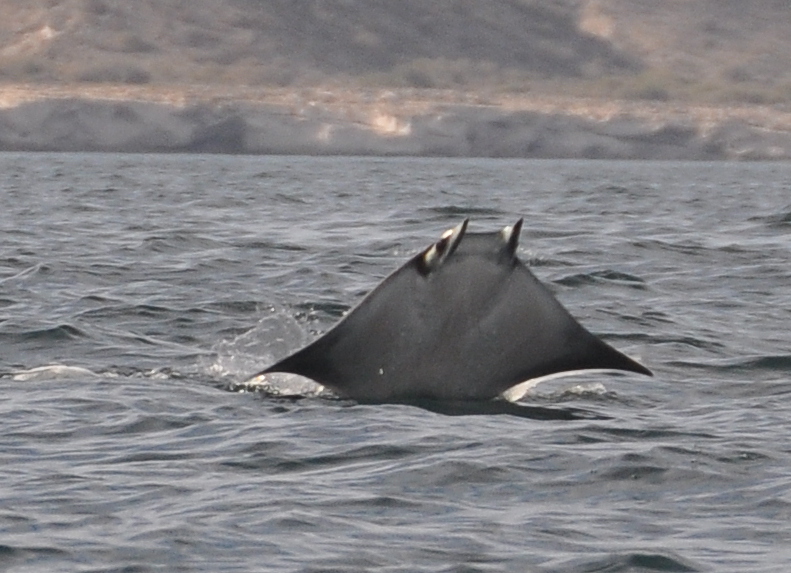 In fact, mantas and mobulas have the largest brain to body ratio of any shark or ray, and are known to engage divers and to show complex behaviors. And complex beings like to have fun! Antoni Murcia, aka Toni DeBaja, adventure kayaker, photographer and marine wildlife enthusiast. In 2011 Toni took time out from his engineering career to pursue one of his greatest dreams: Kayaking the Sea of Cortez, in Baja California. During his epic 2000-mile journey he had many amazing wildlife encounters, each one of them unique, and leaving a lasting impression. He vowed then and there to share his experiences to help protect this environment and its incredible inhabitants.